We share rules or expectations we have for our kids to make being out in public a little easier and how we are trying to raise flexible kids. 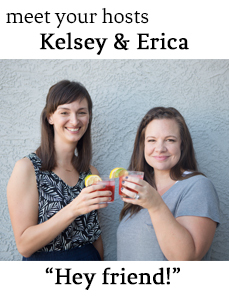 In current obsessions, Erica is listening to all her favorite podcasts on her new SONOS speaker and her Simplified Planner and Kelsey loves sleeping in leggings on our chilly desert nights. In neighborhood news, someone in the neighborhood was apparently pissed at their leaf blower, and Grandpa Vic stars in his own parade a few times a week. P.S. For the Winter 2016 edition of The Girl Next Door Book Club, we're reading Modern Romance, by Aziz Ansari. Read along and listen in on February 17th.